The Vita Audio R1 is a masterful digital radio. Within seconds of switching it on, you're listening to crystal clear music, despite a mono speaker and its diminutive size. In aesthetic terms, the R1 is unbeatable. Clean lines, a grey/black colour scheme and tremendous build quality all hit the spot. The design flourish that most impresses is the R1's dial, or RotoDial as the brochure calls it, which constitutes a volume knob that doubles as the power on/off switch. Every other command surrounds the dial, including five presets and buttons for sleep and alarm timers, adjusting what information is shown with each DAB station (from artist name to signal strength), toggle arrows for searching the menu of available stations and lastly, one for choosing the source. That latter function is not of concern to most DAB radios, but on the R1 it's crucial because the unit offers connectivity and performance beyond its remit. 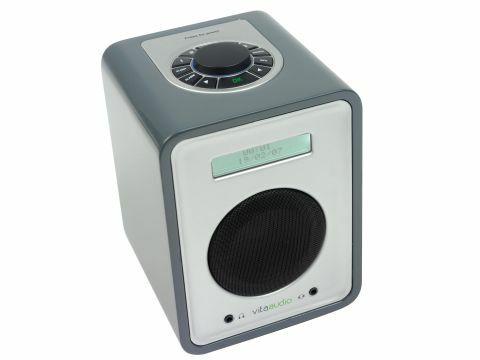 Owners of iPods, MP3 players and even laptops take note: this radio can double as a quite brilliant occasional speaker system. The R1 package actually includes a white 3.5mm phone lead for attaching an iPod's headphone socket to the R1's line input. It's housed on the front opposite a headphone socket. If that's a nice extra, check out the sound quality from said MP3 files. Anything except horribly complex material is given a rounded quality with more detail than you've any right to expect from such music. Look around the back and there's the final proof that this is a serious piece of hi-fi kit: dedicated (and even gold-plated) left/right phono outputs for hooking-up this radio to an amplifier and a single line out for an external speaker. With DAB functionality that's easier to use than any other unit here, vastly superior build quality and sound that simply stuns, Vita Audio's R1 raises the digital radio bar.